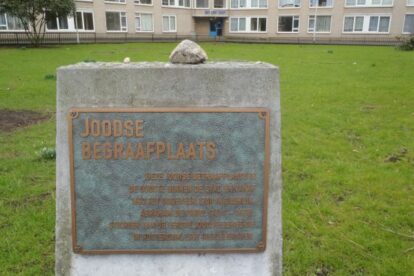 The oldest Jews in Rotterdam reside here. They are no longer alive though – Bet Hagajiem is the oldest Jewish cemetery in the city. Abraham de Pinto, the founder of the Jewish community in Rotterdam is buried here. The history books say further that “the plot was bought in 1613 by Gracia Rodriguez Vega, widow of Gaspar Sanges, and was used until around 1700”. Jewish cemeteries remain sacred ground forever, so the burial stones on the grassy patch are still there, between the modern high-rises. Amsterdam was, and still is, the center of Jewish life in the Netherlands, but before WWII and the Holocaust, Rotterdam was home to thousands of Jews. Sadly, most of them didn’t survive the deportations and the death camps. Today the Jewish community of Rotterdam numbers just a few hundreds (including myself). The Jewish history of Rotterdam is still here though, albeit a bit hidden. It’s places like Bet Hagajiem that keep alive the memory of what the community once was like. If you’re in the neighbourhood, take a detour to lay a rock on the memorial stone. It’s our way of saying “I’ve been here”.